Keep your bookmark online with the help of google bookmarks and access them any where from any computer with an internet connection. Google bookmarks are stored in your google account. You can keep you bookmarks private as well as public. You can also organize you bookmarks using labels and lists. It means organize your sturff into a particular categories or folder. 2 Video Search-You can see the video preview in the same bookmark page. 4 Local Search-you can bookmarks google maps. You can keep your bookmarks privte, public and collaborate. 1 Private-You can only access your bookmarks by login into your gmail. 2 Public-You can share your bookmarks with any one without login into gmail. 3 Collaborate-You can invite to particular email ids to share your bookmarks with them. They can see both public and private bookmarks. 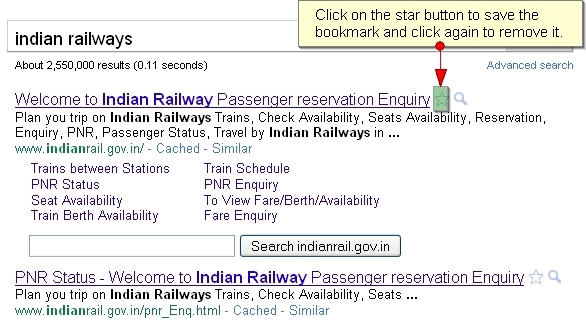 1 Bookmarks Google Search Result-If you are searching something on google and want to add in the google bookmark. First you need to login to your gmail account than search any query in the google. You will see the star button next to search link. Just click on it, will appear in yellow color. It means that link saved in your google bookmarks. It will appear in yellow color when ever it comes in the search result. You can also remove bookmark by clicking on the star button then it will appear in the white color. 2 Bookmarks Opened Webpage-If your webpage is already opened in the browser and want to add it in the google bookmark. You just need to drag this link into your browser bookmark toolbar then click on that link. You will see the new dialog box cantaining title and URL of the bookmark. Now you can save your bookmark.